Geese get a bad rap. Almost everyone I know has a story about a goose or gander knocking them silly for getting too close to a nest, "goosing" them for the crime of existing within reach of their biting bills, or otherwise just being a cantankerous critter that doesn't like people. It would never even occur to most people that geese would make a good addition to their backyard flocks, but the truth is, aside from being tremendously useful, geese are also surprisingly friendly — even affectionate — towards their humans. The fact is, if you were to ask me about the subject, I would say that my only regret about getting geese is that I didn't get them years sooner! They have proven to be the most delightful, economical, and entertaining animals in my flock — not to mention there is nothing in the world as cute or as impossibly soft as a baby goose. Visitors are delighted by their personalities and antics. My students have chosen their own favorites from the flock that they spoil rotten, and even my neighbors throw food out for them to bribe them closer for their viewing pleasure. They have utterly failed to live up to the mean, nasty reputation, and have surprised and delighted in virtually every possible way. Throw in their value as efficient and economical livestock, and you really just can't go wrong. One of the strongest cases for keeping geese is that, in spite of their initial cost, they are remarkably inexpensive to care for and feed. They require minimal shelter, their favorite food is grass, and they're very easy to pen into a specific area since they aren't as nimble as other livestock species. With little more than a few stakes and some snow fencing, you can corral your geese in a particular area of the yard and have them feast on the grass and greens that grow there, mowing and fertilizing your lawn even as they nourish themselves. Geese are seasonal layers, so you won't get eggs from them year-round like you can with chickens or ducks, but because it costs so little to feed them, it's not a problem to keep them on even when they're not producing eggs. When they are laying, they will produce huge, delicious eggs that are similar in richness to duck eggs and excellent for a variety of recipes. That's assuming you want to eat them, of course. You may prefer instead to let your geese hatch a brood of goslings, or even incubate them yourself. Most geese will try to set a nest if given the chance to do so, so you shouldn't have trouble repopulating your flock with new geese if you have a fertile gander. As meat birds, they might seem an unusual choice, but until recently in our history, goose was the traditional holiday feast. 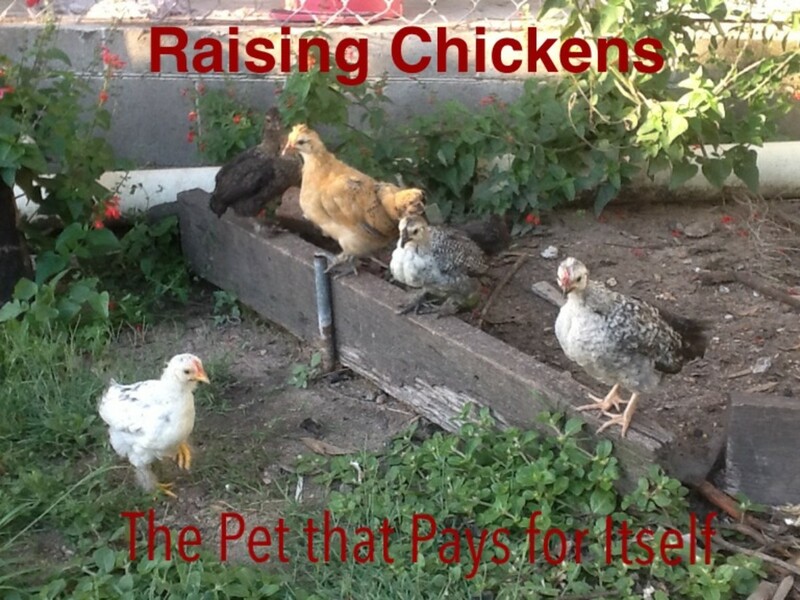 They are a practical choice over turkeys for a small homestead for several reasons. For one, turkeys are difficult to sustain in a small space, as they are agile flyers, accident-prone, and susceptible to a variety of diseases. This means turkeys will likely have to be confined to covered runs, unable to take advantage of forage, and requiring that their meals be brought to them. Geese, on the other hand, can be penned easily. They are too heavy to easily take flight, requiring a sufficient running start and favorable headwind to get off the ground. They are not nearly as accident prone as turkeys, and suffer from very few avian maladies. As a result, you are more likely to see your investment in young birds result in healthy, mature adults, at lower cost than what you could expect from confined turkeys. It may come as a surprise, considering the reputations of geese, to learn that they can be friendly. In fact, geese can be so affectionate, intelligent, and loyal that it isn't uncommon for people to keep them as pets rather than livestock--some geese will even seek physical contact, snuggling up to their owners and wanting to be held. 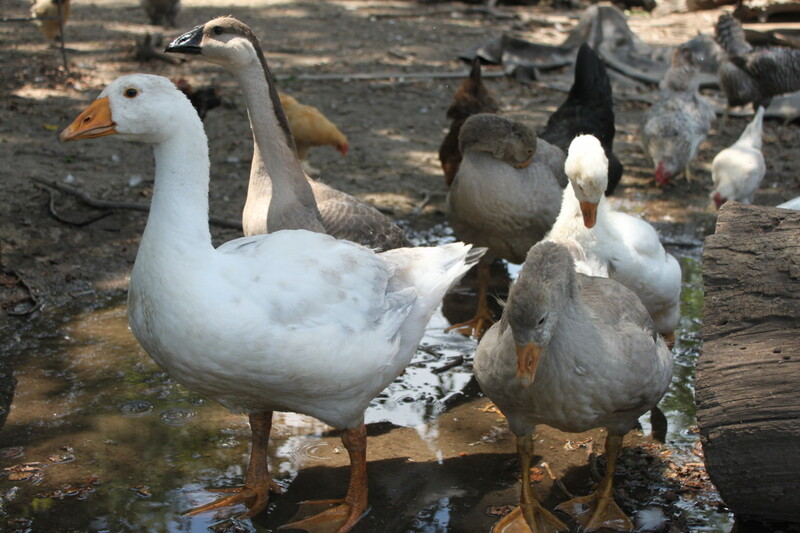 Some breeds of geese are especially people-oriented or docile, such as African browns, pilgrims, and American buff, but most varieties will bond strongly to the people who raise them, even the ones touted as "guard geese" by breeders and hatcheries. Purchasing the geese as goslings will give you a good start, but it is even better if you can hatch them yourself and handle them from the moment they enter the world. This will cause them to imprint on you, and they will follow you faithfully wherever you let them for the rest of their lives. This trait of geese (and ducks, too) makes them very easy to move from place to place. If you need to transfer the geese from one pen to another--perhaps to graze, or to isolate them from other animals or guests--all you have to do is call them and they will follow. If your geese have disappeared from the yard and you need them to come home in a hurry, call out for them and they will answer, returning with greater reliability even than wayward dogs. Exhibit C: They're Just so Gosh Darned Useful! Much like chickens, geese have a variety of uses beyond the obvious tasks of producing eggs and meat. As I mentioned before, they can be pets, but they can also be put to work as your own personal landscaping crew, mowing down grass and weeds, fertilizing, even weeding your garden in some cases. You won't be able to completely get rid of your lawnmower and weed eater, but they will cut down significantly on how often you have to mow or pull up weed trees because they spend the vast majority of their time wandering around and nipping off grass and other greens. 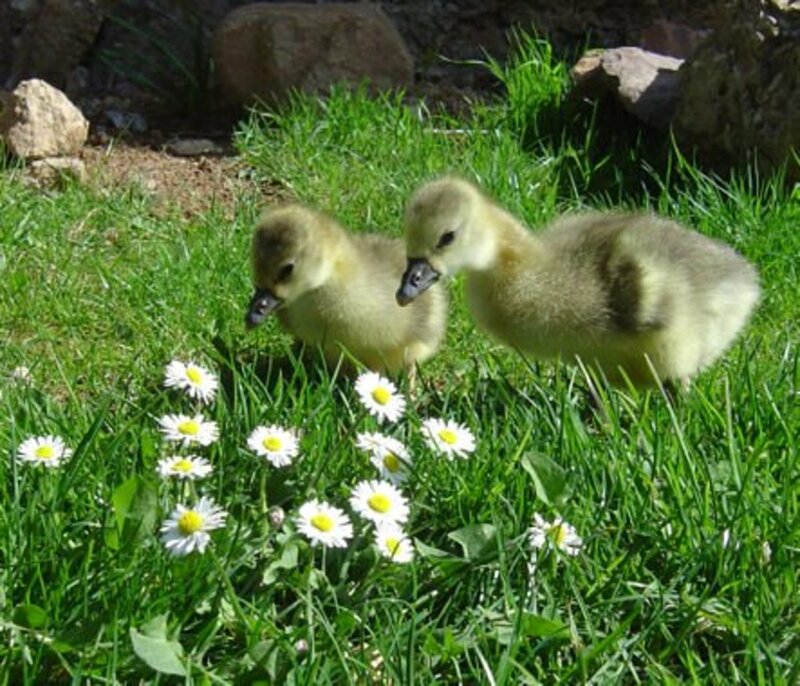 They don't scratch like chickens or dabble like ducks, so they won't destroy your lawn, and because of their passion for dandelion greens, they will swiftly eradicate any of these tenacious plants that they find. 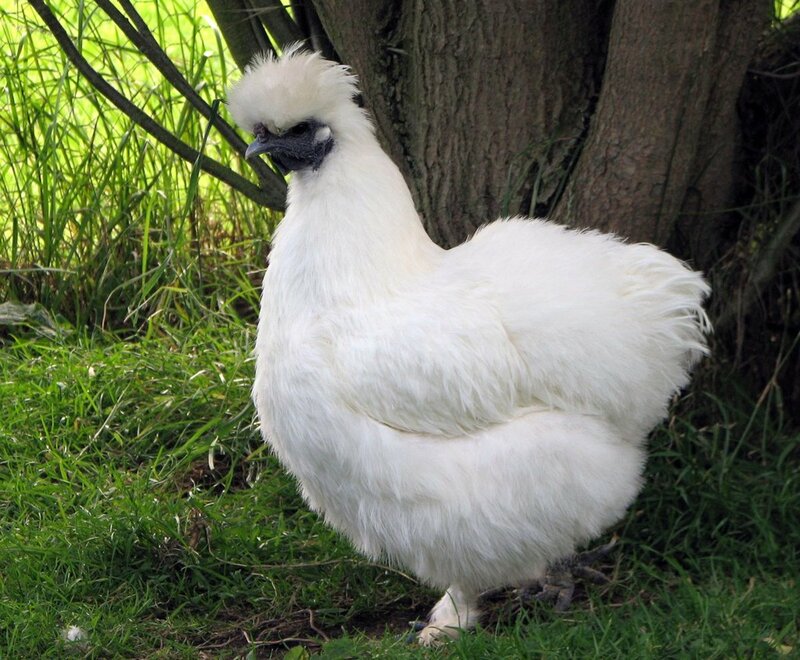 Some breeds are known as "weeder geese", and depending on the crop you are raising, they can be turned loose in the garden to eat the weed grass that grows there. I have had minimal success with this, since the varieties I have also like to eat my garden plants, but it is something to consider researching in greater depth if you are intrigued by the prospect. One of the comments you're likely to hear the most often when you tell people you're planning on getting geese is that they poop--a lot! This is not an unfair observation, because geese do produce a lot of waste. However, much like other herbivores like horses or sheep, their poop is mostly chewed-up plant matter, and doesn't have the foul odor of droppings from animals like chickens, turkeys, or ducks. This doesn't mean you can ignore cleaning up after them completely, but it does make the odor and mess much more manageable. As a bonus, their droppings make excellent fertilizer. Your garden will benefit greatly from compost that includes the goose poo you muck out of their run. 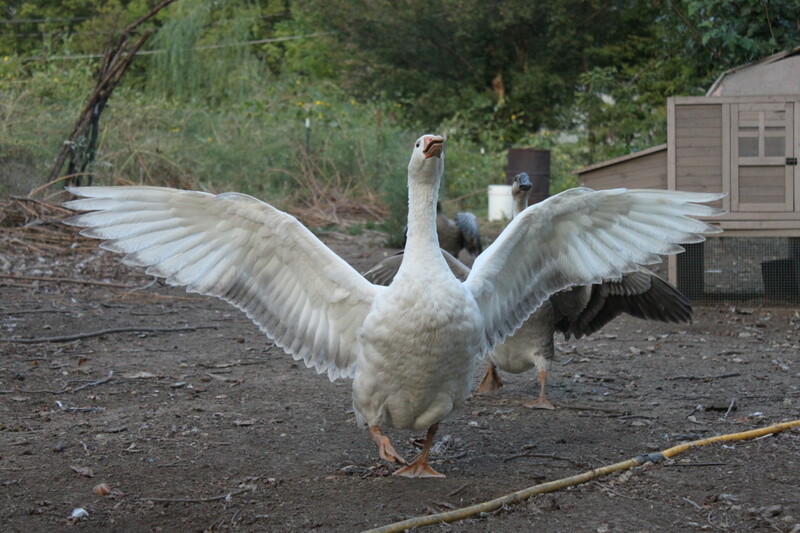 It is super, duper easy to care for geese, really. First of all, geese are a lot tougher than other species you might be used to, like chickens, ducks, and especially turkeys. They suffer from very few diseases or physical ailments, seem to have an easier time keeping warm, and are ready to start chowing down on grass almost from the get-go. (provide grit to any goslings in confinement that you are providing greens to). As they grow into adults, they will need less shelter than chickens or turkeys, and as full-grown geese, they will be able to fight off most small predators, including foxes. Goslings and juveniles will still be vulnerable however, so keep them in a secure run until their wings have fully developed. As I mentioned, food is a lot easier than you would suspect. Goslings really don't enjoy chick starter or chicken feed much, but a head of romaine lettuce will disappear faster than a cow carcass in a tank of starving piranha. Pretty much any greens or natural grains will thrill your goslings--just make sure to provide some form of grit to help them digest it. Also, steer clear of iceberg lettuce. Commonly referred to as "crunchy water", it has very little nutritional content compared to green leaf, romaine, or other varieties. As adults, your geese will generally be happy to graze for their food. Sowing your yard or pasture with nutritious plants like clover will help supplement their diet and give them a tasty treat to look for in the grass. 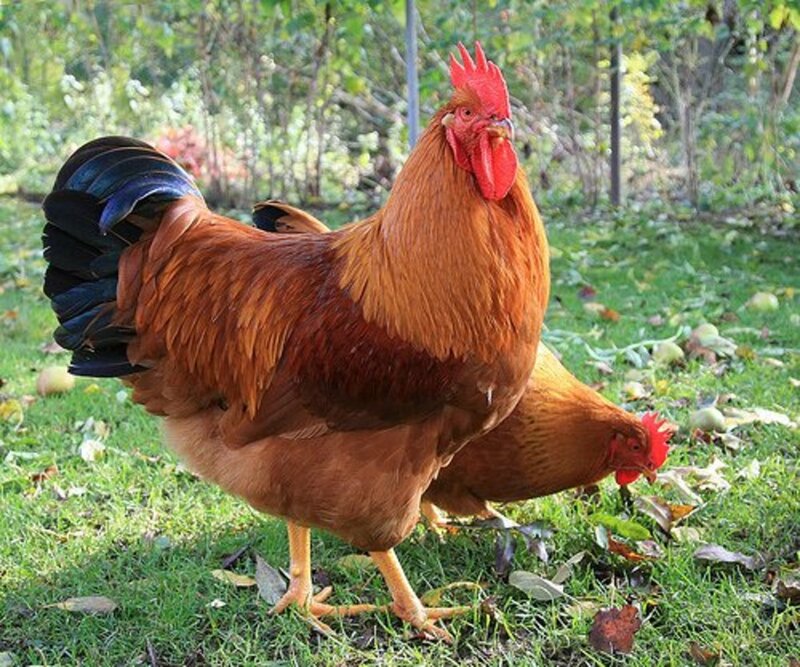 In the winter, a bucket of water with scratch grain at the bottom will keep them entertained and fed, and of course, you can throw them your kitchen scraps any time of year, just like you would with chickens. 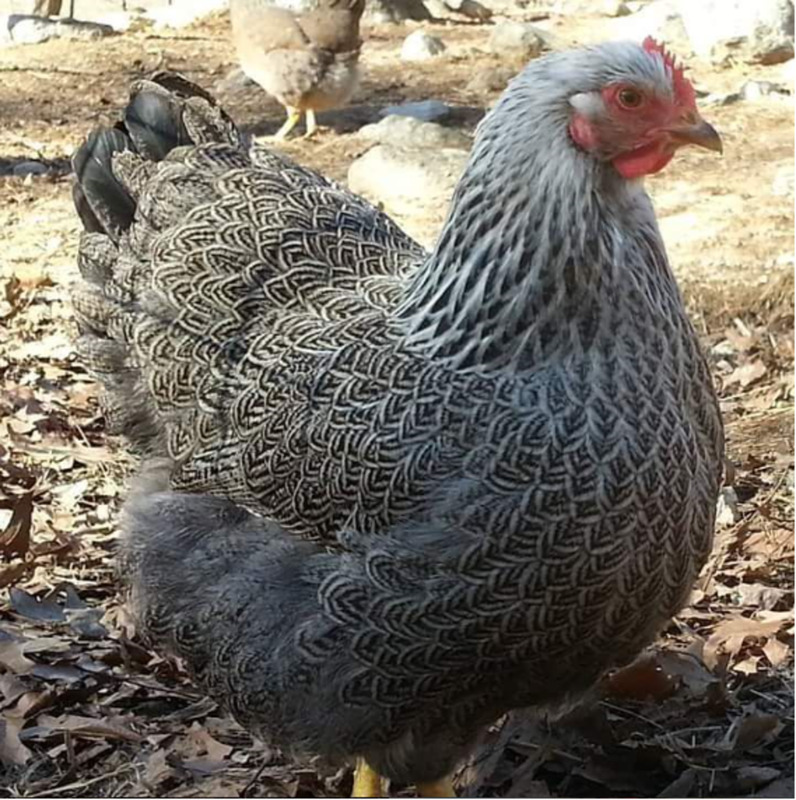 If you have to feed them formulated feed due to a lack of adequate pasture, "all flock" or "flock raiser" pellets will suffice, though they seem to prefer the scratch grain to anything else--especially if you have soaked it first! Shelter is remarkably simple as well. Goslings of course will need a supplemental heat source and shelter from rain and snow, while adults will need some kind of roof they can get under and possibly a wind break. My entire goose family takes shelter under an open-ended shed when they need to, but in most weather is happy to sleep out in the open--even in the rain. They mostly only seek the shelter of the shed to lay eggs and brood. A simple lean-to with some straw to nest in may be all the more your geese need. Their health needs are blessedly minimal. There are very few ailments that afflict geese, and they seem to be especially robust and hardy. It is unlikely that you will need to seek advice regarding the health of your geese, but if you do, there is a vibrant online community willing to step up and assist you. The most likely ailments you will encounter will be injuries, which is not to say that geese are particularly accident prone--it's just more likely that they'll injure themselves than get sick. Obviously, since geese are waterfowl, they will benefit from having something they can swim in. I tend to use plastic kiddie pools, because they are relatively easy to drain and clean. If you don't have the ability to set up a pool for some reason or another, your geese will be grateful to at least have a bucket of water that they can submerge their heads in. This will help them clean out their bills and nostrils, but sooner or later, they'll need standing water that they can bathe their whole bodies in. So, how do you go about interacting with your geese? 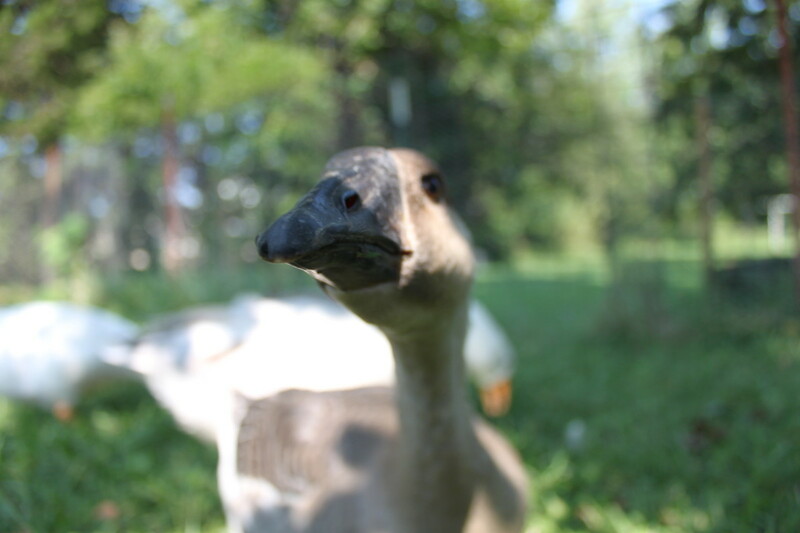 If you have heard (or experienced) horror stories involving mean geese, it may seem logical to be afraid of them. However, geese are deeply social, affectionate birds who will only attack people who are perceived as threats. If you raise your geese from infancy, handling and feeding them regularly, they will recognize you as family and are more likely to be friendly to people in general. The best possible scenario is to hatch them yourself so you can start imprinting them on you from minute one, but even just raising them from goslings will usually be enough. If you acquire your geese as adults, they are likely to be more territorial and distrusting of you. Patience and bribery are the way to go, though there is no guarantee you will ever be able to convince them to fully trust you. Bring them treats like romaine lettuce, bok choy, spinach, or other greens, and talk to them (loudly) while you feed them. Geese are very vocal creatures, and will benefit from the conversation. You can yell their names or just say "I love you" over and over--it's more about the tone than what you're actually saying. Although it sounds absurd to someone who has never owned geese before, the difference in reception you will get from your gees when you talk to them is profound. During the breeding season, when ganders are tense and territorial, a few strong words from me is enough to make them cease their posturing. Loud honking, chewing on your shoes, and tilting their heads to look up at you are signs of trust and affection. Alternatively, you may have a meek or quiet goose who demonstrates her adoration for you by following you closely and making soft, whispery honks. It seems to vary somewhat by breed and individual exactly how your goose prefers to say "I love you". Whether you acquire your geese as eggs, goslings, juveniles, or adults, it's important to talk to them. The more you talk to them, the more they'll trust you, even like you. Sometimes, geese will puff up and charge someone they know and love, simply because they didn't recognize them. Talking to them and announcing your presence will help alleviate any confusion. In addition, you can develop a special call for your geese that will bring them in from any corner of the property. This is especially useful if you have a large plot of land that you let the geese roam freely on. Use the call whenever you feed them treats or fill their pool, and you will find that before long, they will come running from wherever they are when you make it. Some geese may even decide to snuggle with you. This cannot be forced, and is entirely up to the goose, but don't be alarmed if your goose wants to climb into your lap or snuggle up next to you when you sit on the ground. Your geese may even gently nibble at you with their bills in a sort of "goose kiss". These little nibbles are not aggressive and are a form of social grooming behavior. If your goose kisses you, that means they love you! Geese reach maturity relatively quickly, laying eggs perhaps as early as 6 months of age. 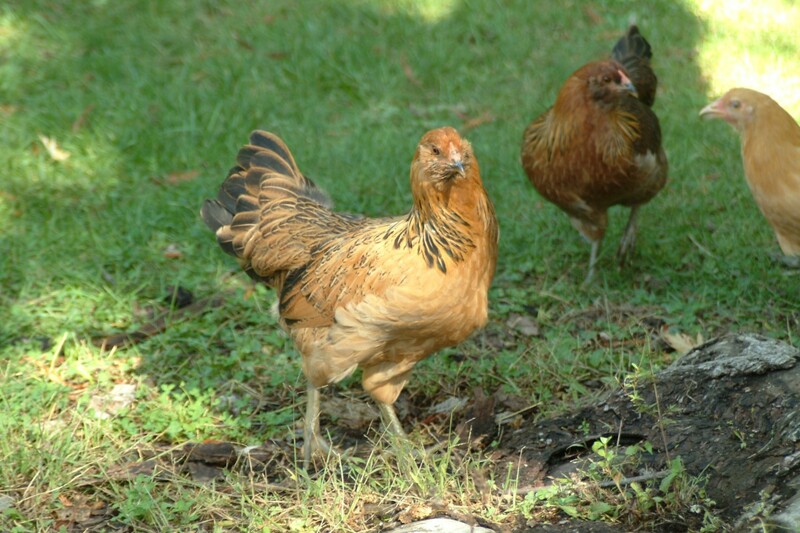 Although they mature as quickly as chickens, they are seasonal layers, so only expect to get eggs from them in the late winter through early summer. Eggs laid outside of this timeframe are the exception rather than the norm, so if you have a year-round laying goose, treasure her! 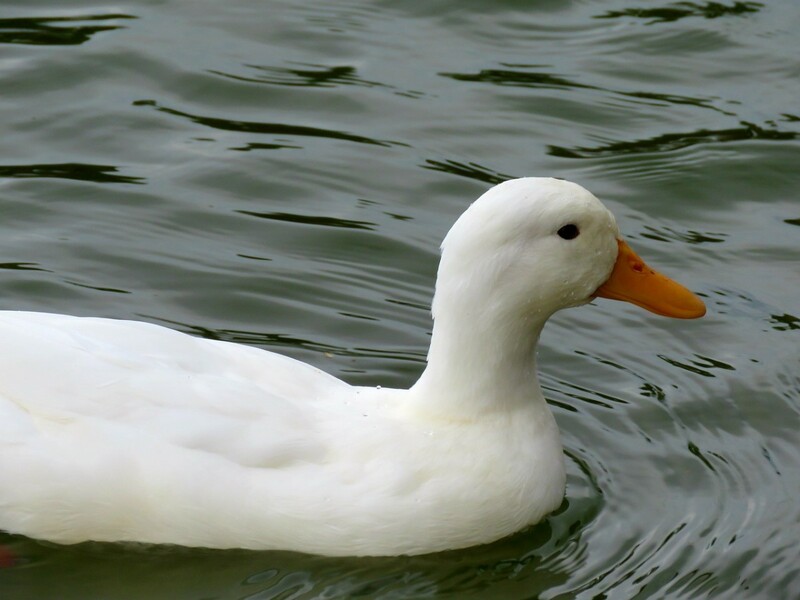 Geese benefit from having a body of water such as a pond or pool to swim in when they mate, so if you plan to breed your geese, you will need to provide them with a swimming hole. In addition, some breeders have reported low fertility in geese and ganders under 2 years of age, but my geese were successfully breeding before they were even a full year old. Your results may vary as well. To encourage your geese to go broody and hatch their own eggs, leave the eggs in the nest, or seed the nest with fake eggs if you intend to introduce them to purchased goslings later. Once they have assembled enough eggs in their nest, they will make up their own minds to sit. Keep in mind: once your geese commit to a clutch of eggs, they will stop laying for the rest of the year, so if you want more than just a few goslings out of them for the season, collect the eggs to hatch and raise yourself. 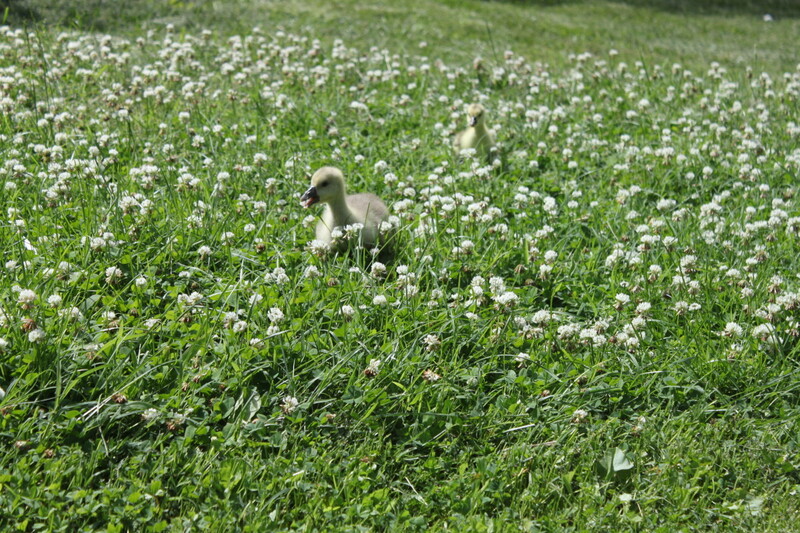 Once the goslings hatch, raising them will be a family affair. Keep an eye on your gander as not all ganders are good fathers, and may attack or even kill the goslings, not realizing that they are in fact baby geese. Alternatively, some ganders will happily dote on goslings, perhaps even goslings they didn't father. Assuming everyone in your flock understands their role, the goslings will integrate seamlessly into the family unit, introduced by their mothers, and protected by everyone in the flock. This makes predation of goslings less of a risk, and eliminates the need to brood the goslings in a special pen with a heat source. Would you consider getting geese? I already have them and I love them! I already have them. They're alright. I have them and I'm planning on getting rid of them. I plan on adding geese to my flock. I haven't yet decided if I want geese. I do not have any plans to get geese. Yes and no. 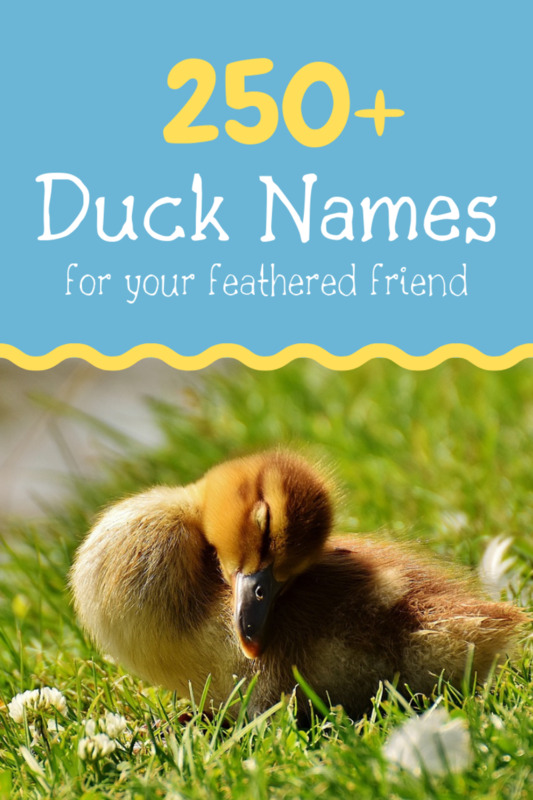 They cannot fly as well as wild geese, but with a strong headwind, may make sufficient loft and distance to clear a fence or--in one peculiar instance--end up on your roof. Usually, they will only fly for short distances, when very excited, and will not have an interest in getting off the ground very far. What is wrong with geese who suddenly can not stand or walk? There are a number of afflictions that may be at work. If you have several geese experiencing these symptoms at once, then your culprit is either a viral infection or a nutrient deficiency. Unfortunately, without more information, I cannot narrow it down more than that. Is a pond necessary for geese ? I wear long dresses( denim), when my geese tried to bite they just got a mouthful of skirt. Yes, I've been chased by a goose before. They are fast lol. The video of the Mother Goose was really cute to watch!